Well, let’s look at the period from 1990 to 1996. During this time the stock market steadily rose, and as the textbooks would predict, historical volatility dripped lower and lower. But what happened from 1996 to 2001? 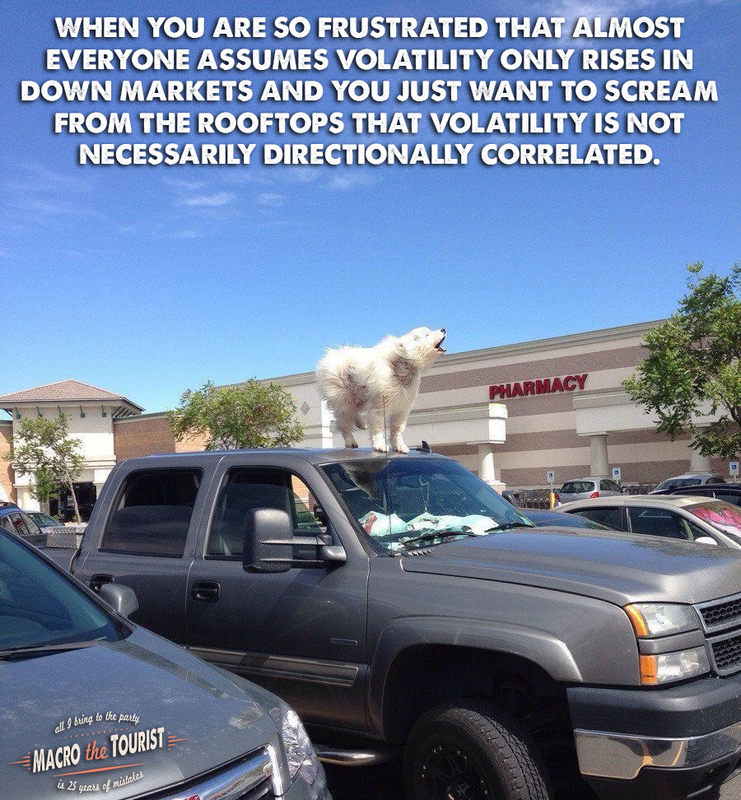 Well, stock markets went even higher, so volatility must have collapsed, right? Or at least stayed at depressed levels? 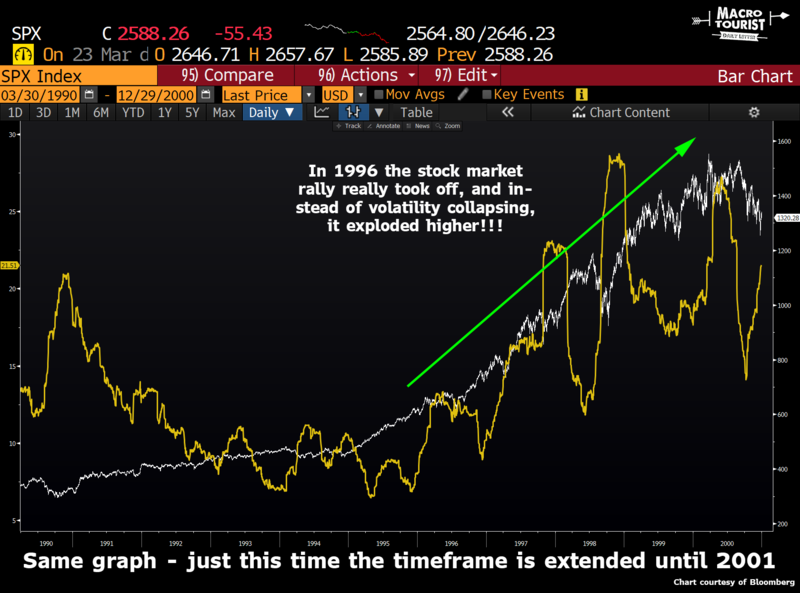 During this time the S&P 500 more than doubled, but so did the realized volatility. 90-day historical volatility went from 8% to spiking above 25%, with the average firmly pushing 20%. Please don’t misconstrue this as some sort of proclamation that VIX is heading higher. 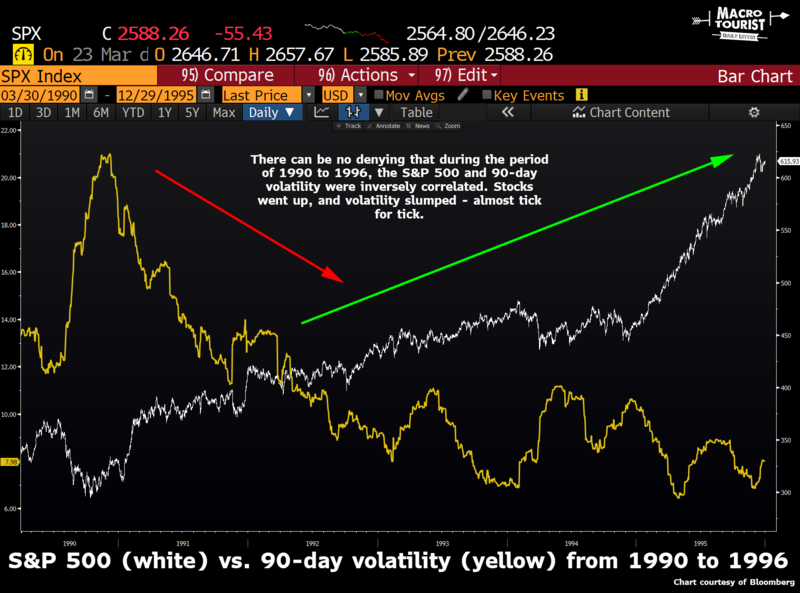 If you pay careful attention to my language you might note that I referenced realized historical volatility. VIX is not the same thing. One is the actual amount of variability in the prices of the underlying security, and the other is an index that is based on the implied volatility the market place is willing to pay for options that settle at some point in the future. As we saw during the recent VIX-pocalypse, the price of that index does not necessarily reflect underlying conditions and might have more to do with specific supply demand forces. All I know is that there have been periods where both stocks and their realized volatility have both headed higher. Don’t assume that by shorting VIX or executing some other short volatility strategy that you are inherently betting on a higher stock market. No doubt, that on average, that conclusion is correct, but how many times have we seen stable relationships completely thrown out the window? It would be just like the Market Gods to punish the vol sellers by having both volatility and stock prices shoot higher in the coming quarters. Those vol sellers would lose on both sides. The short volatility strategy will end up being a loser, while the synthetic short of not being long equities would also be a drain on the portfolio. Not a prediction, but it might be just the kind of out-of-the-blue outcome that hurts the most market players. And if there is one thing that I have learned over the years, it’s that markets often end up going to the point of maximum pain for the most amount of players. Higher volatility and higher stocks might end up being that sort of unexpected outcome.